I discovered something while browsing the fabulous COS Summer Sale today: COS has become my favorite clothing store. It’s not just their fanatical devotion to a modern minimalist aesthetic, it’s that they also manage to produce incredibly well-made clothes for a reasonable price. I could see myself wearing at least 90% of their sale section, which made it awfully hard to pick a single item to feature. This 100% wool cocoon coat has a classically minimalist silhouette that won’t be going out of style any time soon. It features high-end details like contrast lining, overlapping seams, and a double-ended metal zip. Sure, it’s a bit too warm most places to wear this right now. But, it will be a wardrobe staple as soon as fall rolls around. Talk about value. Bonus: that gorgeous bottle green draped cardigan I featured in top shopping finds a few weeks ago is also marked down! 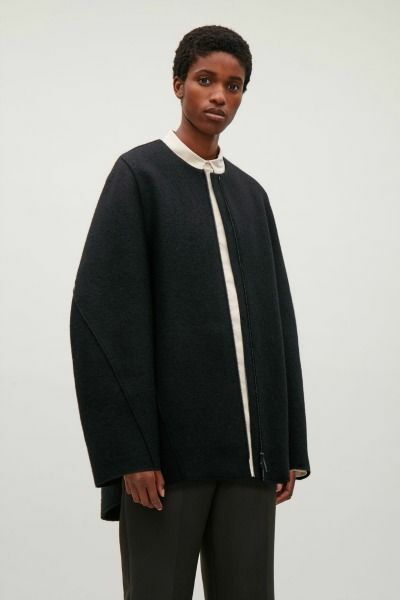 → Buy the COS Wool Cocoon Coat, $75.00 (was $250.00), at cosstores.com.